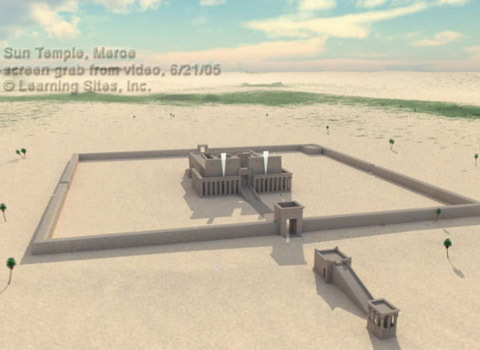 Bill Riseman constructed an experimental 3D computer model based on archaeological evidence from the Sun Temple (ca. 250 BCE) at Meroe supplied to him in 1991 by Friedrich W. Hinkel, retired, East German Academy of Sciences, Berlin. With this model, Riseman studied the advantages and disadvantages of using different rendering engines to reproduce more complex shapes and scenes and to produce finished effects than had been heretofore demonstrated by others working in computer graphics. 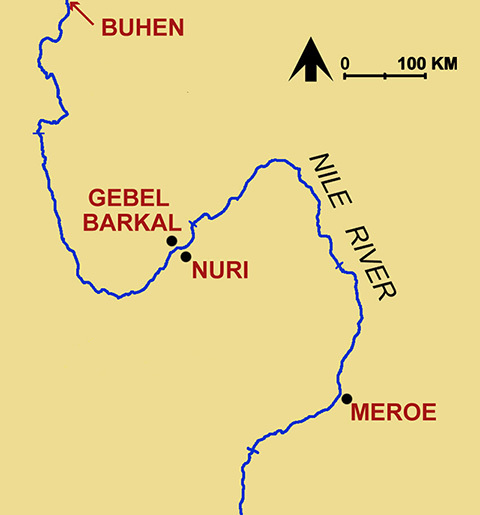 Meroe is located after the fifth cataract of the Nile River, southeast of Jebel Barkal. Riseman's computer model of the Sun Temple included all information about the building's foundation walls, entrance ramp, hypostyle halls, and internal sequence of temple spaces (see the aerial view of the temple complex at the left; hover over to enlarge). The model also included other interior rooms and exterior accessory structures; an early example of applying advanced 3D graphics for visualizing archaeological reconstructions. The basic vector data used to construct the various 3D models was made to be easily imported into any rendering engine in general use. For example, when Riseman worked on these data, there were simple shading programs, such as Velocityby CadKey, and more complex procedural shaders, such as Rendermanby Pixar (similar then to the programs used by George Lucas of Industrial Light and Magic), which use complex mathematical algorithms to calculate, store, and display subtle variations in form, texture, and shading. Riseman also experimented with 3D Studio by Autodesk and Crystal 3D by Time Arts, Inc. (an example of one rendering technique is seen in the temple courtyard at the left; hover over to enlarge). During 1990s, the major disadvantage of simple shading or texture-mapping programs is the repetitive nature of the applied textures, although they can be modified. The programs tend to be quick, easy to apply, and flexible. Procedural shaders, on the other hand, can generate more sophisticated textures all produced from a few lines of programming code; therefore, they can reproduce nearly infinite gradations and subtleties in textures that can be applied to any type of surface. Their major disadvantage is their slow speed to render out. In 2005, LEARNING SITES was engaged by the National Geographic Society to resurrect the Meroe model so that we could generate flythroughs for a middle school DVD.